Here is another B&W photo. I wanted a moody picture to express loneliness and darkness. And a bulb not lit up was perfect. It was Ironic to have a dark bulb. To accomplish that mood, I underexposed the picture measuring the correct exposure on the highlights. It appears Fall has arrived. 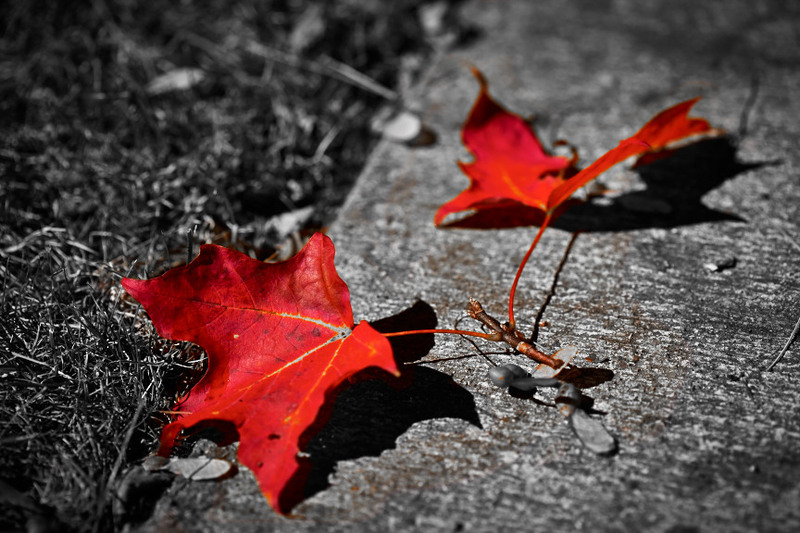 We saw the first signs of fall when we came out and saw some of the red leaves on the ground. It got me excited. Fall is one of my favorite seasons. In this picture, we decided to only leave color in the leaves, and turned everything else black and white. This is a technique used to bring all the attention to the subject. Yesterday, after a bike ride, I cleaned my bike. I got inspired by the gear's shape. So I decided to get the macro lens and take a close up of it. It looks a lot cleaner when you are not using a lens. But I like the little bit of dirt still on the bike. It adds texture and a bit of drama to the picture.